Module 2 covers the role that Forest Certification plays in promoting responsible forest management practices, including an overview of the main types of certification: 1) Forest Management certification and 2) Custody certification. We will also discuss additional standards for sourcing fiber from uncertified forests. Forest Management certification covers the certification of actual forests. This involves a voluntary process whereby an independent third party (the “certifier”) assesses the quality of forest management against a set of requirements (“standards”) predetermined by a public or private certification organization, as a way of informing consumers about the sustainability of the forests from which wood and other forest products were produced. Forest management certification standards are developed in an open, transparent process, and are adapted to local context to reflect different forest types and cultural considerations in different regions of the world. Forest management certification emerged in the 1990s in response to market concerns about unsustainable forest management that was threatening forests including illegal logging, and forest conversion to agriculture or other uses, primarily in developing countries, which we discussed in Module 1. The “Save the Rainforest” and “Boycott Tropical Timber” campaigns of the 1970s and 1980s for example – succeeded in raising awareness amongst consumers and putting pressure on the industry. It was clear that a mechanism was needed to identify timber from genuinely well-managed sources and to reward “good” producers. Third-party forest management certification is an important initiative to offer a verifiable mechanism to promote better forest management. It provides a proof-point that forests are being managed for economic, environmental and social benefits. Forest Management Certification is issued to a forest owner or manager who is assessed to be managing forests according to the Standards. Ultimately, a third-party certification body will audit the land manager against the requirements in the Standard to ensure they are meeting the intent of these standards. Those landowners and land managers who have gone through a successful audit, can then make claims their forests are certified to these standards, and sell wood fiber off their land as certified. There is strong diversity of the types of landowners that get certified to forest certification standards, including private landowners, government, universities, non profits, tribal groups and conservation lands. Private landowners use forest certification as a proof point their management and wood products meet rigorous environmental requirements. Provincial and state lands use forest certification to demonstrate to their stakeholders, the constituents in that area, that their forests are managed under these strict guidelines. A university or non profit organization may use forest certification as a teaching tool to ensure that youth or the public can gain understanding of forest management. Indigenous Peoples or Tribal organizations may use forest certification as a way to align land management practices with their own values. Conservation lands, which are lands primarily intended to meet conservation related purposes, also use certifications as a way to ensure sustainable practices. Globally there are two major umbrella organizations that provide forest certifications: The Forest Stewardship Council (FSC)® and the Programme for the Endorsement of Forest Certification (PEFC)TM. Both of these organizations set international benchmarks by which regional and national standards receive endorsement under one of these organizations. PEFC represents 61% of all global certified land and FSC represents 39%.The Sustainable Forestry Initiative (SFI), is a national program in the US and CA that is endorsed under PEFC, accounts for nearly 40% of PEFC certifications worldwide, and represents almost 25% of all global certified acreage. There are lands that are dual certified, and this chart does not take into account those dual certifications. In North America – There are four major forest management certification programs in the United States and Canada, which include the American Tree Farm System (ATFS), Canadian Standards Association (CSA), Forest Stewardship Council (FSC), and the Sustainable Forestry Initiative (SFI). Each certification system works according to a set of objectives and operating principles. These sets of principles provide guidance on governance, standards development, assessing the qualifications of certifiers, and the procedures for verifying that practices meet the certification standard. These certification systems all differ in their scope, approach, and governance. 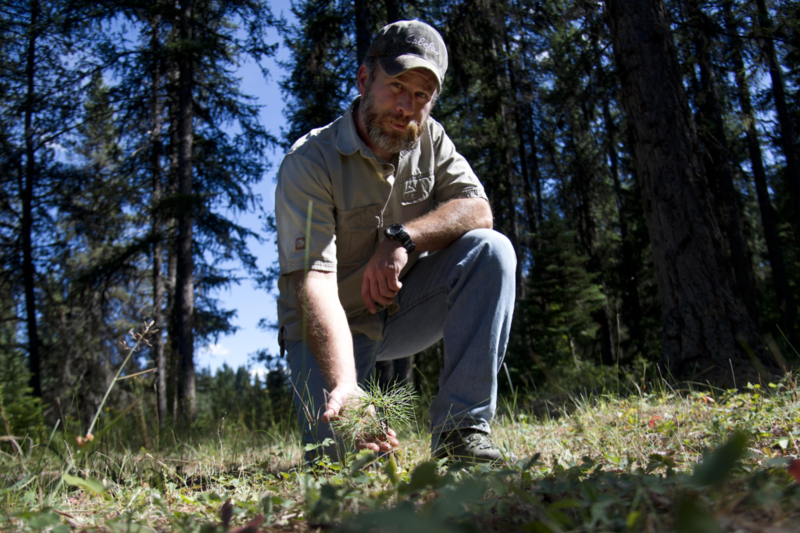 The ATFS is designed for family forest landowners in the United States. CSA is designed for government tenured land in Canada. Both SFI and FSC apply to all forest types in both the United States and Canada. The ATFS, CSA, and SFI forest management certification programs are endorsed by PEFC, as described previously. SFI is the largest certification program in North America and fastest growing. Much of this growth has taken place in Canada as well as on state-owned public lands, indigenous/tribal lands, and community lands (Boy Scouts, universities etc). Some companies have a preference for one certification system over another, but many accept more than one certification in their forest products sourcing criteria. In addition, many forests are certified to multiple standards. At GreenBlue, we are an inclusive organization – we do not endorse or have a preference for any one specific system – and recognize the value of all of these systems. Although the U.S. and Canada are low risk in terms of illegal logging and other unsustainable forestry practices, they contain nearly half of global certified forestland, at 241 million hectares or 48% of total certifications. After this, Europe comes in second with 189 million ha or 37% of total certifications. Other regions of the world, including many developing nations, have very little certified forestland. As we discussed in Module 1, these are oftentimes those places most at risk for deforestation and in need of Responsible Forest Management assurances. Only 11% of the world’s forests are certified. Chain of Custody certification is an accounting system tracks fiber from forest management certified forests through production and manufacturing to the end product. While Forest Management certification covers the start of the supply chain – the direct management of forests, it does not account for what happens to this fiber afterward. 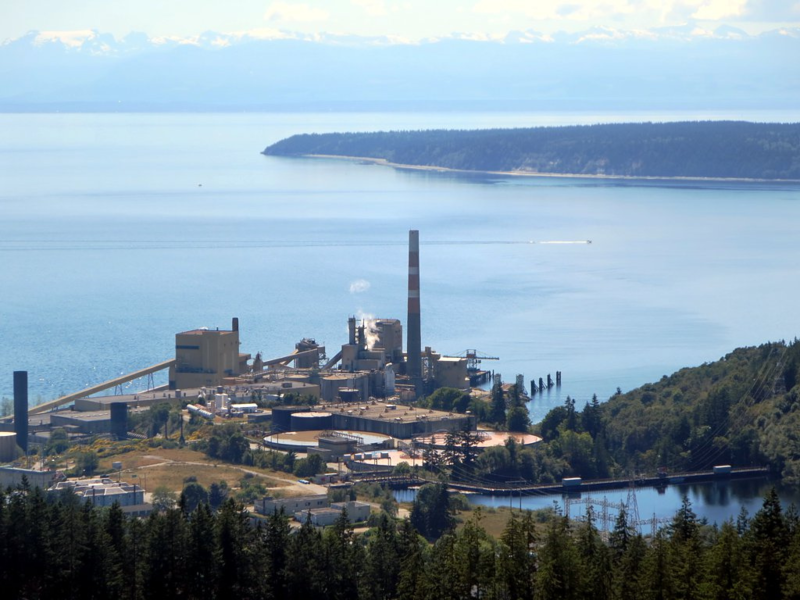 Oftentimes mills accept fiber from a variety of sources, not just certified forests and so CoC helps to track certified fiber and other fiber through the whole supply chain. Brands can therefore use chain-of-custody certification to track and communicate how much of their product comes from certified lands. SFI, FSC, and PEFC all offer both Forest Management certification and CoC certification standards. CoC Certification does not certify land, but rather certifies companies that process certified fiber and follow the standard to track certified forest content and responsible sources. CoC certificates are issued to manufacturers, distributors, printers, or any other organization in the supply chain that process certified fiber. Each supply chain player must be certified under chain of custody, since at any of these points, controversial sources might be reintroduced to the mix. If any one of these links is broken then you lose CoC certification. There are two main ways organizations can track this fiber through chain of custody accounting: credit systems or through a percentage method. The percentage method allows a chain-of-custody certificate holder to label or make claims on all of their products. If the organization knows they have 40% certified content for example, they can make claims on 100% of their products with a 40% claim. The credit method allows a chain-of-custody certificate holder to label or make claims only on the percentage of output corresponding to the percentage of certified content. If the organization knows they have 40% certified content, they can allocate that on 40% of the products they manufacturer. Chain-of-Custody certification tracks responsibly sourced fiber. This includes fiber from certified forests but it can also include fiber from un-certified forests and recycled content. By tracking all of these inputs to a final product, CoC allows brands to know the percentage of fiber that comes from the various fiber resources available and ensure that all of them are responsible sources. Remember that 89% of the world’s forests are uncertified. Because of this, uncertified fiber must also play a major role to meet fiber demand. To many brands however, it is unclear if uncertified fiber can still come from responsibly managed sources. To be included in a product with a certification claim, fiber from uncertified forests must be checked or ‘verified’ to ensure the material is not from controversial sources. Several different programs have been developed to ensure that potentially risky uncertified material is not used in certified products and that only uncertified fiber that has been verified to be low risk can be used. These programs include: PEFC Controlled Sources, FSC Controlled Wood, and SFI Fiber Sourcing. It’s important to understand that these are NOT the same as forest certifications. Rather they offer an alternative assurance mechanism for sourcing fiber from uncertified forestland to ensure the material is low risk. These programs differ in requirements and scope, as described below, but the general principle is that companies that are certified to these standards, implement a system and/or risk assessment to ensure that uncertified material sources do not come from controversial sources. These requirements protect against controversial sources, like illegally logged areas, or areas designated with high environmental values. PEFC Controlled Sources: In May 2013 PEFC published a revised PEFC Chain of Custody standard, which allows organizations to handle fiber from non-PEFC certified forests and to sell it with a ‘PEFC Controlled Sources’ claim. This claim demonstrates that a risk assessment was implemented to ensure that the fiber from these uncertified forests is legal and in compliance with relevant regulations. In addition, it avoids controversial sources and does not allow fiber to be sourced from genetically modified trees or from land converted to non-forest use. FSC Controlled Wood: A company level certification developed and published by the Forest Stewardship Council (FSC). This standard specifies material from acceptable uncertified sources that can be mixed with FSC-certified material in products that carry the “FSC Mix” label. This standard aims to ensure the avoidance of ‘bad wood’, which includes wood that is illegally harvested, harvested in violation of human rights, harvested in threatened forests with high conservation values, harvested in forests being converted to plantations or non-forest use, or wood from forests with genetically modified trees. SFI Fiber Sourcing: A standard to certify manufacturers of wood products, which source fiber from a variety of sources, requiring them to show that the raw material in their supply chain comes from legal and responsible sources. The standard aims to avoid controversial sources by avoiding illegal logging and fiber sourced from areas without effective social laws. 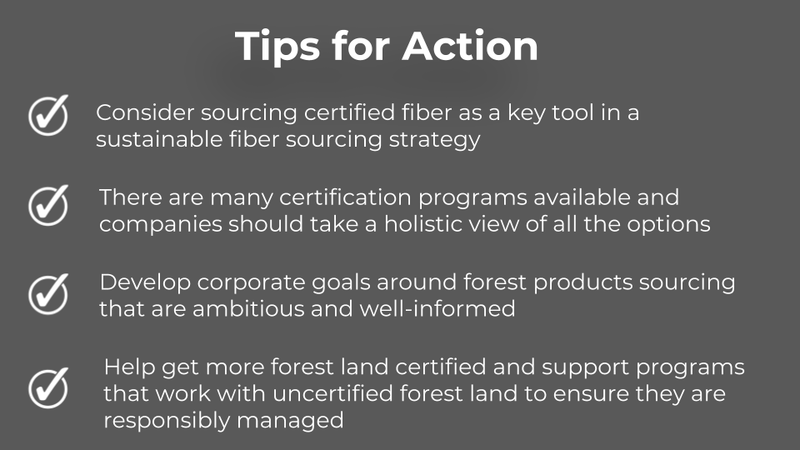 The fiber sourcing requirements also go further by including measures to broaden the practice of biodiversity, use forestry best management practices to protect water quality, provide training to foresters, engage in research, and outreach to landowners. This standard encourages the spread of responsible forestry practices such as conserving water quality, providing outreach to landowners and using the services of trained forest management and harvesting professionals. The major certification programs reflect this diversity of fiber inputs in their certification claims and labels. Some of their claims and associated on-product labels look at virgin fiber, some recycled, some a mix. Some look at only certified forest content (i.e. FSC 100%), while others look at responsibly sourced fiber from uncertified forests. The majority of labels look at inputs from mixed sources (i.e. FSC mixed, SFI and PEFC labels), using different chain of custody accounting methods. Each of these claims provide credibility and assurance the fiber in the product comes from good sources. SFI, FSC and PEFC all offer unique on-product labels for products, which indicate to consumers that fiber in the product is from responsible sources. Products that use fiber certified by SFI can use the PEFC label as well as SFI on-product labels. Other national programs use either the FSC or PEFC label depending on which program they are endorsed by. 2) an enhancement in the benefits of responsibly managed forests. Many brands and suppliers source certified products by buying from a certified supply chain in order to reduce legal and reputational risk exposure and enhance their image as a responsible company. By sourcing certified products, companies can not only reduce risks but can also support the health and continued flourishing of our forests and the ecosystem services they provide. Forests are incredibly important to us and so brands should be proud to source from them and celebrate the opportunity to support them. By focusing on the benefits of sourcing from responsibly managed forests, companies can reframe their sourcing policy in a positive light and enable themselves to meet multiple sustainability goals like social empowerment in communities they work in, carbon sequestration, biodiversity, water and other goals associated with the many ecosystem services forests provide us. Certification, both Forest Management standards, Chain of Custody standards, and standards for fiber from uncertified but responsibly managed forests, is an important tool to ensure you are sourcing from responsibly managed forests and encouraging the generation of these benefits. In a survey conducted by SFI of its Program Participants, which include various supply chain members that are certified, the top reasons cited for becoming certified and emerging issues of interest included these ecosystem service benefits of responsible forest management. These included: Biodiversity and conservation, climate change mitigation, improving water quality, production of bioenergy, other ecosystem services, and carbon stocks. Some companies are taking it a step further and working to expand the amount of certified forest lands as a way to further realize the many business benefits of forest certification. In 2015 Apple announced its purchase of a million acres of forest in China – in an effort to control and source sustainable packaging for its products. Apple’s first goal, to increase responsible management of working forests in China by creating up to 300,000 acres of (FSC) certified forests, was reached in just two years. They also bought land in Maine and North Carolina. SFI’s Forest Partners® – Meredith, the National Geographic Society, Macmillan Publishers, Pearson, Hearst Enterprises and Boy Scouts of America – have a goal of certifying 15 million acres of forests to the SFI standard by 2020. By collaborating on shared objectives and linking market leaders directly to stakeholder groups, SFI and its Forest Partners are working together to strengthen forest practices and procurement through certification. While many brands have responsible forest product sourcing policies, these brands actually put resources into growing certified supply. 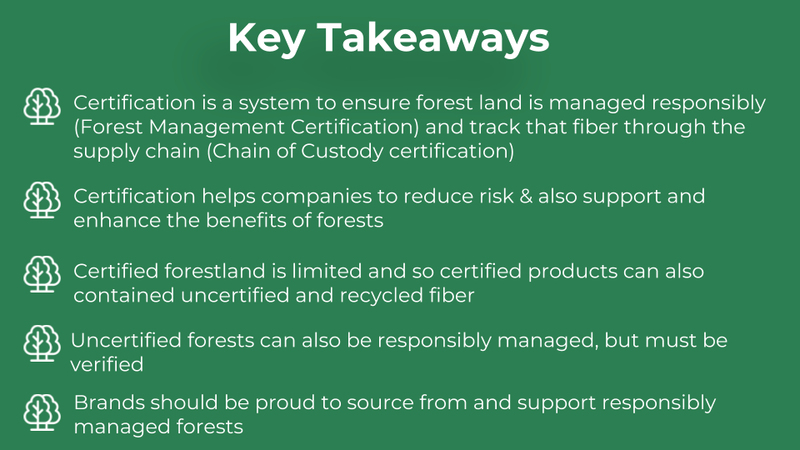 Certification is a system to ensure forest land is managed responsibly (Forest Management Certification) and track that fiber through the supply chain (Chain of Custody certification). 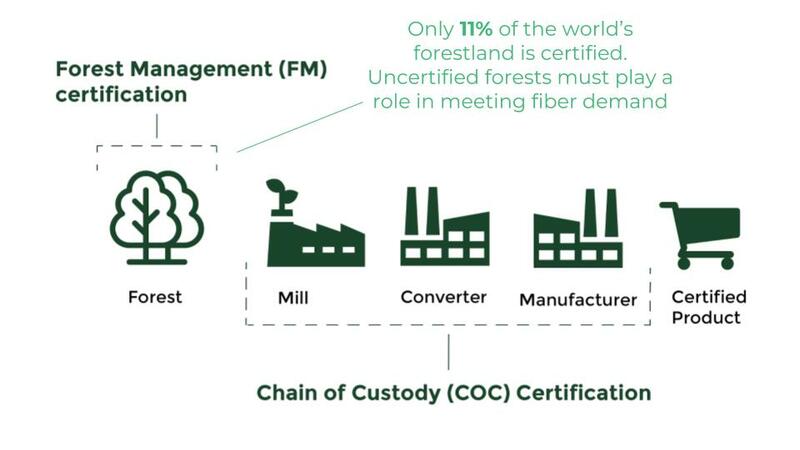 Certified forestland is limited, only 11% of forests globally, and so certified products often contain mixed materials – including uncertified fiber that has been assessed to be low risk, as well as recycled fiber. Uncertified forests can also be responsibly managed, but must be verified by programs like SFI Fiber Sourcing or FSC or PEFC Controlled Wood to ensure they meet minimum sustainability requirements. Brands should be proud to source from and support responsibly managed forests, and have the power to motivate positive outcomes by generating demand for sustainable practices.